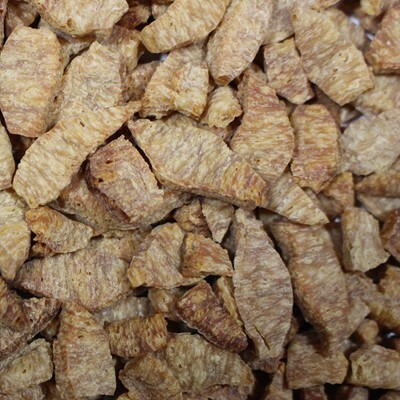 Our BULK BOX contains a FULL 12x12x12 CUBE of fresh textured vegetable protein chunks! Excellent for backpackers, RV'ers, or for your cupboard! We introduce our little "secret" to making great tasting vegetarian dishes. A textured protein that is ALL VEGETABLE provides substance and taste to your favorite recipes. 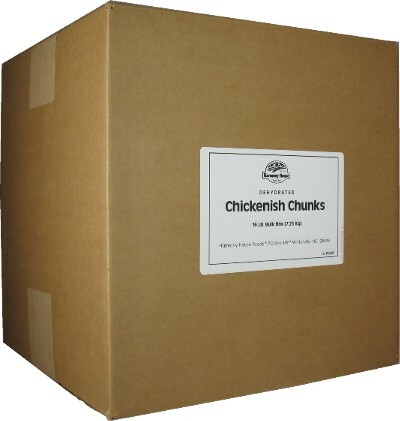 Use our bulk "Chickenish Chunks" TVP as you would chunky chicken. Put it directly in soups, stews, or other dishes that are being cooked. 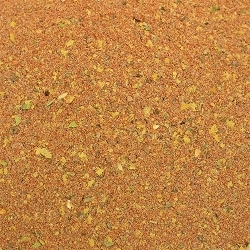 Use in "shepherds pie" or as part of a "chicken" salad. When cooked or rehydrated these textured vegetable protein chunks have a light, flaky, tender, yet chewy texture that is irresistible. It is not like the tough cardboard taste you may find in other products. This is our favorite TVP product. Our bulk chickenish TVP is a MUST HAVE for any vegetarian kitchen!